Truro & Penwith College Students only £5. Tickets from Gate 4 only, you will also need to show your current College Card. 1. 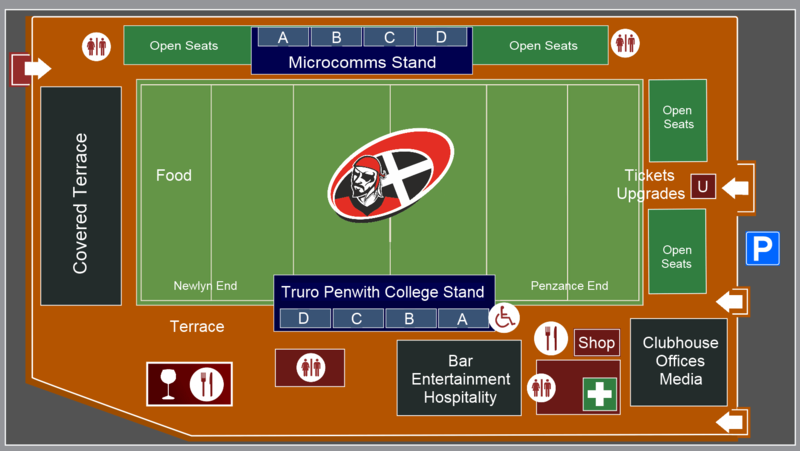 These conditions incorporate the Penzance & Newlyn Rugby Ltd ground rules as displayed in the ticket office. 2. You must enter the ground entrance indicated on the front of your ticket. 3. Should the event be cancelled, postponed or circumstances dictate the event occurs at an alternative venue, no money will be refunded. If the event is rescheduled the ticket will be valid for the new date. 4. The ticket issued subject to ground/safety and on Penzance & Newlyn Rugby Ltd, it’s servants or agents will not be liable for loss, injury or damage as expressly exclude by the unfair contract terms act 1977. 5. Entry will be denied to persons carrying alcohol or any drink container as expressed in the safety of sports ground act 1975 and where admission is refused in such circumstances no money will be refunded. 6. Admission cannot be granted if the ticket arrives less than 30 minutes before the advertised time. If entry is refused no money will be refunded. 7. On no account will money be refunded. The possession of this ticket shall constitute an acceptance by the holder of these conditions and imply an undertaking on his/her part to observe them. 9. Ticket holders give their express consent to the use of their actual or stimulated likeness in connection with the production, exhibition, advertising or exploitation of this or future events any/or products in any/all media throughout the world.